A result of the Ukrainian Government decentralization program is the establishment of 665 Consolidated Territorial Communities (CTCs), new rural units comprised of small communities, with decision-making powers and budgets transferred from central state authorities. 87 percent of CTCs heads report positive effects of the reform according to a July 2017 DESPRO survey. Understanding that effectively managing land is both a challenge and growth opportunity for CTCs nationwide, Agriculture and Rural Development Support (ARDS) designed and supported a pilot project to establish a CTC-level electronic land management system combined with the creation of local economic development strategies. The pilot in the Kipti CTC, a typically-sized CTC comprised of 12 villages, 5,500 people, and 29,5000 hectares, had three goals: obtaining and archiving data on quality and quantity of land resources; creating a plan for efficient land use that addresses CTC needs and is compliant with environmental legislation; and increasing land use efficiency, enabling CTCs to manage community-owned land. The electronic land management system allows for immediate access on available land, resources, property, infrastructure, and land use restrictions. 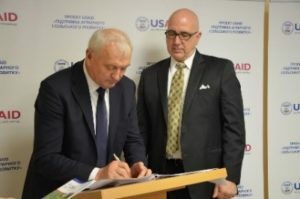 The Kipti CTC electronic land management system revealed that just by renting available land, UAH 1.8 million in taxes could be generated for the CTC’s budget. This is significant for Ukraine when multiplied across the other 412 CTCs. The system proved to be an efficient tool for engaging the public in land management, and identifying new economic opportunities and for attracting local investments. The system helped the Kipti CTC develop solutions for citizen needs, e.g. waste management and infrastructure. The pilot helped Kipti CTC create a viable local economic development strategy based on efficient land use that balances the interests of citizens, businesses, and the community. The effort fostered community leadership and citizen behavior change: CTC witnessed proactive engagement by the CTC and citizens in CTC management and community wellbeing and future growth. Based on lessons learned across the pilot elements – community engagement, electronic land management systems, and local economic strategy development – ARDS has developed a toolkit for CTCs nationwide to guide community leaders on more effective land use and strategic planning. The pilot also helped identify regulatory and legislative steps which need to be taken to fully enable land management systems for all CTCs.